Last week we drove around our city as a family. It was nice getting out together. We find ourselves around the house for the most part seeing that Matt is dealing with so much pain. Don't get me wrong we love home but we also really love getting out. We explored Rio Grande together. It's a street covered with big trees, adobe and cacti! 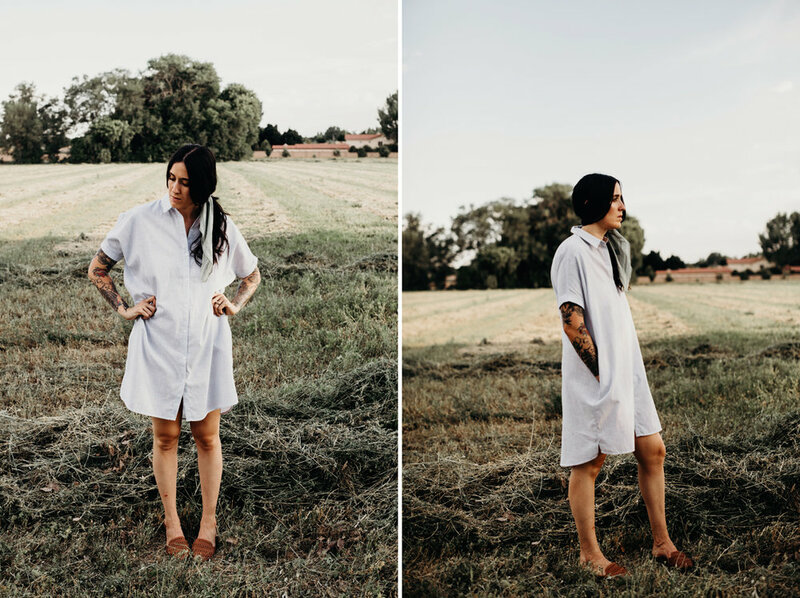 We let the kids explore while Matt snapped some photos of me in this new dress from Mill and Finery. Mill and Finery is a local shop! I love that people are opening rad shops around town! Ladies, if you haven't been to this shop you should! Mill and Finery is filled with independent labels and some favorite brand names. I really love that they are all about community and make the effort to be part of it! Get to know Jessica who is the owner of this rad little shop! Can you share a little bit about yourself and how you decided to open your own shop? My name is Jessica Bovee and I’m the owner and head buyer at Mill+Finery. I have worked in the fashion industry for over 10 years. I attended the Art Institute in Los Angeles and graduated with a degree in Fashion Marketing in 2010. While in school I interned at a variety of companies including VOGUE. Pretty much everything I know about working in the fashion industry I learned at VOGUE. It was a grueling and unforgiving environment, but ultimately proved to be a priceless experience and I am grateful that I was given that opportunity. I wouldn’t be where I am today if I hadn’t been exposed to the industry through that internship! I then briefly worked at the Giorgio Armani corporate headquarters in NYC before deciding to move back home to the southwest. I worked in retail management for the next six years before taking the leap and branching out on my own. Do you enjoy living in the desert? love living in the desert. I grew up here in Albuquerque and truly didn’t understand how fortunate I was to be from such a gorgeous place until I moved away. I love the vastness of the desert. The beauty in the desolation. It’s trancelike and soothing expansiveness. I distinctly remember feeling physically and mentally suffocated while living in New York City and longing for the quiet comfort of the desert and it’s endless sky. That’s when I knew that it was time to come home. feeling. After I narrowed it down to about five words, I just started putting them together and seeing what sounded pleasant. Mill+Finery just stood out to me and that was that! How do you decide on what product to bring in your space? for me to step into the buying role. Currently we are looking to bring on more sustainable eco friendly brands and we are slowly phasing out some of our fast fashion brands. I also love supporting local businesses and we carry some amazing Albuquerque based brands such as NeoThread and Genuine and Ginger. What are some of your hopes and dreams for your journey as a shop owner? My hope is to offer an elevated shopping experience for everyone who comes through our doors. Accessibility is very important to me as a business owner and as a avid fashion consumer. My goal is to create a welcoming and warm environment. We recently relaunched our website (millandfinery.com) and I am hoping to continue to grow that by maintaining the same level of customer service we offer in our brick and mortar. I don’t have huge aspirations as far as expansion or anything like that. I just want to offer the best possible shopping experience for our visitors.